I can’t believe this year is almost over. Time goes quickly when you are busy having fun. 2013 has been great in many many ways. At the beginning of the year Anna Brones and I started to work and develop recipes for our first illustrated cookbook together. The book is scheduled to be published by Ten Speed Press, Spring 2015. For the second year in a row I made illustrations for LRF, Lantbrukarnas Riksförbund (a major Agriculture organisation in Sweden) for their yearly brochure. This summer, my illustrations were seen in both Art of Eating (no. 91) and The Foodie Bugle (2nd issue). In July The Culinary Cyclist, with illustrations by me, was published. 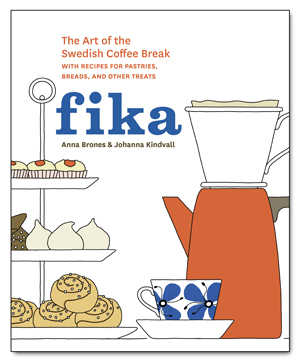 The book is written by Anna Brones. In July I was part of arranging the 2nd triennial exhibition Instrument at the old mill in Lövestad, Sweden. Over 30 artists from around the world participated. One of my tasks was to bake 20 loaves of breads for the grand opening of the exhibition and to sew the cover for the catalog. In the Autumn I illustrated the future of public transportation for SL (public transportation company in Stockholm). And just a few weeks ago I created graphics and illustrated icons for Courtney Carver’s site A Simple Year that launched earlier this month. Another exciting job was to draw an illustrated ginger cookie recipe as a Holiday Card for Tara K. Reddi, vice president of Marlborough Gallery. The card was printed in letterpress. On top of everything else I have been in the middle of renovating our new place, with periods of times without a proper kitchen and drawing space. I’m quite amazed that I have been able to create and work on so many projects and recipes with all the dust of a major renovation project going on around me. I have to say at times it has been quite extreme, especially when I had to take a more active part in the renovation (e.g. tiling, plastering, sanding, painting, laying and sanding oak floors or just holding the other end of a tape measure etc etc). After all this I now feel like having a drink. 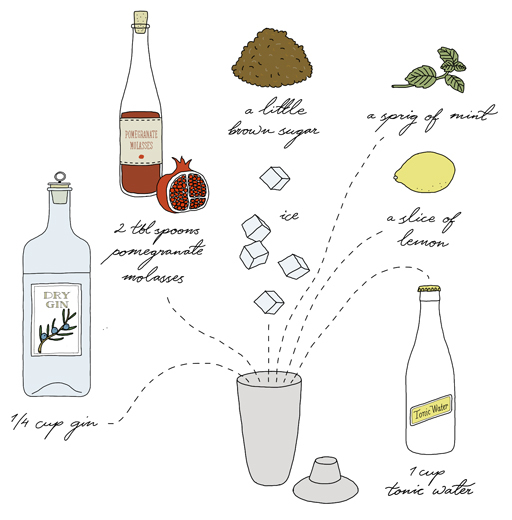 The above illustrated drink recipe is at the moment my absolute favorite drink.